I haven’t done much cooking lately. I’ve been looking through my new cookbooks—Curtis Stone’s “Good Food, Good Life” and the Smitten Kitchen cookbook—and have been dining out a lot because it’s Dine Around Seattle month, and when I’m home I’ve been eating a lot of tacos and other homemade concoctions that I haven’t felt were exciting enough to share. Yesterday I found myself with a couple hours at home, so I wanted to cook so I’d have something to blog about. Especially since I failed to post something last week. 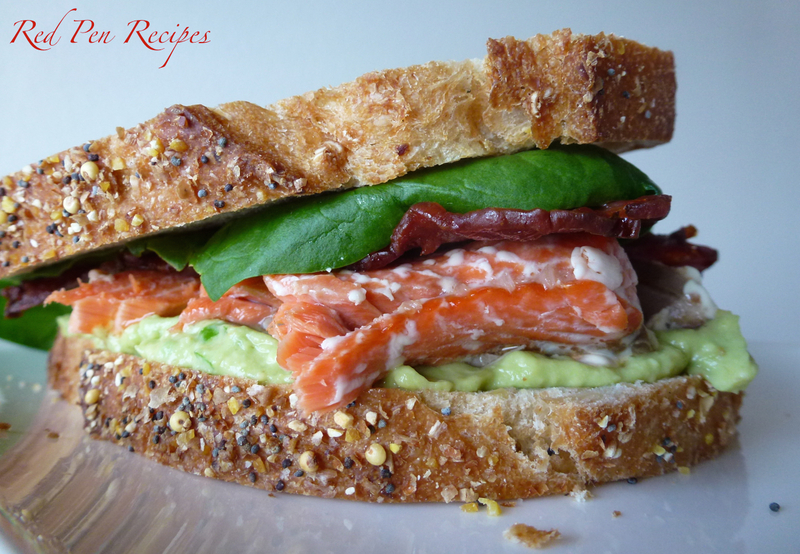 I pulled my Barefoot Contessa “Foolproof” cookbook off the shelf and found a recipe for a Salmon and Guacamole sandwich. I had most of the ingredients on hand, so I decided to put this together with a bit of improvisation. The original makes four sandwiches, but the one below makes one. Ciabatta has been on my list of recipes to try for quite a while now. In lieu of having made any, I decided to just use some multigrain bread I had on hand. But I did get some ciabatta started. Hopefully I’ll have that to share next week. Since I’m not a big fan of guacamole, I didn’t put all the usual stuff in it. I really like the flavor of fresh avocados on their own, and I’ve always felt the pepper and other additions just detract from that. For this recipe, I kept it simple. If you haven’t baked the bacon or the salmon, preheat the oven to 425 degrees. Place the bacon on a cooling rack on top of a cookie sheet and bake for 15 minutes. Meanwhile, place salmon in a baking dish and squeeze lemon juice on it. Once the timer goes off, place the salmon in the oven with the bacon and bake for 15 more minutes, or until salmon is cooked all the way through and the bacon is crisp. Scoop the avocado into a small bowl and mash with a spoon. Add green onion, jalapeño sauce, and salt and stir until combined. Spread mixture onto one slice of bread. Place the salmon on top. Add bacon and spinach and top with other slice. Serve.